What if, for one brief shining moment, the greatest Bronx Bombers in history could gather together—each in the ultimate prime of their careers—to swap stories, talk shop, pal around and have a ball…and what if WE were lucky enough to be flies on the clubhouse wall bearing witness to it all. 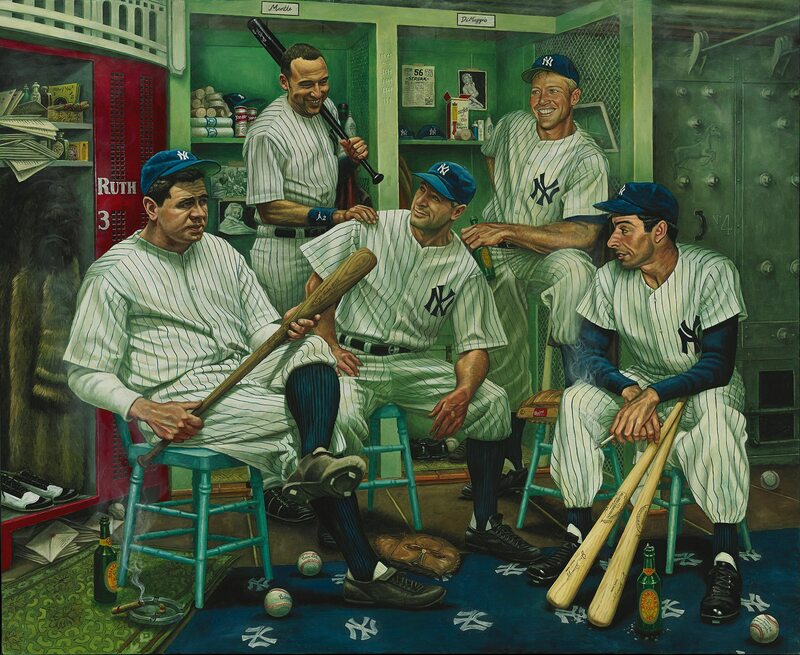 As I reported back in February, artist Jamie Cooper was beginning to work on the Yankees Dream Scene painting. After numerous sketches and hours of hard work, Mr. Cooper has finished another one of his masterpieces. This 4.5′ x 5.5′ painting will be auctioned off by Legendary Auctions on August 2nd in Chicago, right in time for the National Sports Collectors Convention. Many Phillies fans are familiar with Cooper’s work as he is the artist behind the Phillies Dream Scene that now hangs in the Diamond Club at Citizens Bank Park. The amount of research that Mr. Cooper puts into his pieces is amazing. 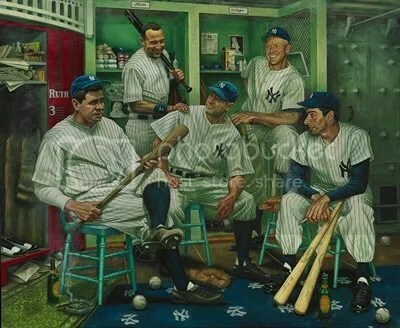 The Yankees Dream Scene consists of Babe Ruth, Lou Gehrig, Mickey Mantle, Joe DiMaggio, and Derek Jeter. Just like with the Phillies Dream Scene, Mr. Cooper has thrown in a lot of little historical details that you might not see right away. 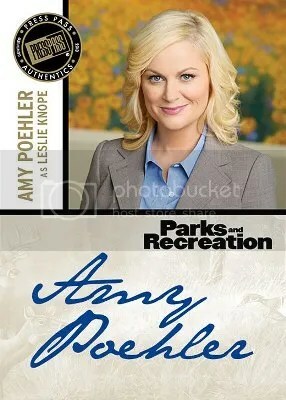 Congrats to KMH on being the lucky winner of the Amy Poehler 2013 Press Pass Parks and Recreation Dress Relic. Once KMH sends me their mailing address, I will ship this card ASAP. Thanks! 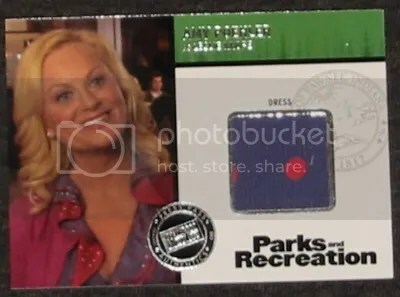 This contest is for an Amy Poehler 2013 Press Pass Parks and Recreation 2-Color dress relic from Season 2 Episode 16. Good luck! 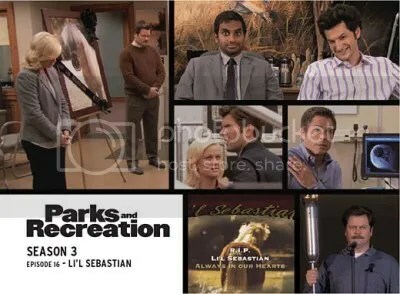 The 90-card base set covers various scenes from Seasons 1-4. Each card in the base set is designed to look like a page from a comic book. There are multiple images on every card separated by block panels. 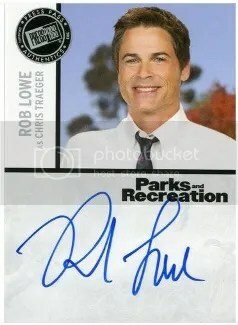 When it comes to the autographs and relics Press Pass made good use of the color white which allows them to really pop. Boxes are currently selling for $63.00. Every box should contain at least (2) autographs and (1) relic. I was surprised to see that other than the (1) foil parallel you get in each pack, there are no other inserts to look for. With a strong autograph checklist, its safe to say the autographs are probably the real meat and potatoes of this product, especially the ones with inscriptions. I like that Press Pass tells you which season and episode the relics come from. They also picture the entire relic on the back of the card. 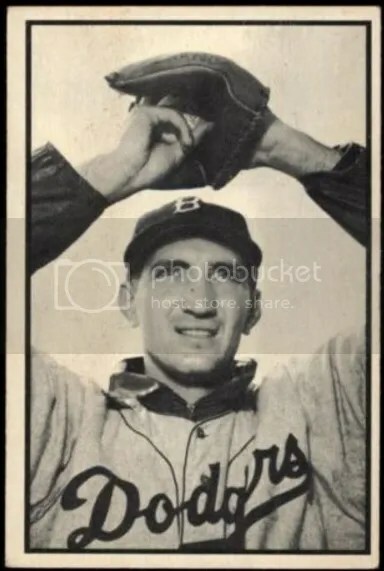 This use to be the practice with sports cards years ago, but it quickly died out. You see this a lot more today with entertainment products. 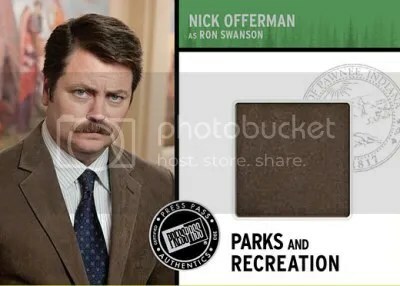 Overall, I give 2013 Press Pass Parks and Recreation 4 NBC peacocks out of 5 (1=poor & 5=perfect). Press Pass announced during the Industry Summit earlier this year that they planned to get into more entertainment properties. Besides KISS and Elvis, Press Pass never really stepped away from the sports world. There are a lot of television shows that have a strong following, but very little for its fans to collect. I’d like to see Press Pass produce a set based on Seinfeld or Saturday Night Live if they decide to stick with NBC shows just for now. One card I would keep my eye on, especially next year, would be the Chris Pratt autograph. Pratt is scheduled to play Peter Quill/Star-Lord in Marvel’s Guardians of the Galaxy due to be released in August 2014. If that movie is a success and for some reason they don’t make a Guardians of the Galaxy product, this card could be on the rise. During the Industry Summit, Press Pass announced that they plan to get into more entertainment properties. Their newest entertainment product will surround NBC’s hit show Parks and Recreation. Collectors will find (2) autographs and (1) relic card per (24) pack box. 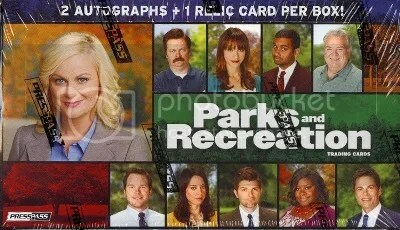 The base set will consist of (90) cards covering scenes from seasons one through four. Press Pass has seen much success with their other entertainment properties such as Elvis and KISS, so it makes a lot of sense for them to move into areas like this. Along will all the main characters from the show, think of all the guest stars that could have autographs in this product. I know its probably a long shot, but I would like to see Press Pass make an autograph/relic card of Will Ferrell’s character Ricky Bobby from Talladega Nights: The Ballad of Ricky Bobby. Given their long history with NASCAR, and the notion of wanting to make more entertainment driven products I think it would be a perfect fit. Trading card products based on pop-culture television shows is nothing new, but there are a ton of unexplored areas that haven’t been touched yet. Lets hope Press Pass can obtain a license to make Seinfeld cards.